Aromatherapy oils are widely known for their fantastic health benefits. Aiding in everything from stress to acne, there’s a lot of essential oils out there and each has its own impressive benefits for the whole family. They’ve grown massively in popularity over the years, but when searching for safe aromatherapy oils for babies, it can prove a little tricky. The trouble is, when you’re looking for baby safe aromatherapy oils online, you’ll come across a lot of conflicting advice. There’s also a lot of fraudulent oils on the market, so parents do need to be vigilant when choosing ones for their baby. If you’d love your little one to experience the benefits of essential oils, here you’ll discover everything you need to know. Before we look at which oils to invest in and which ones to avoid, there’s a few factors to consider. Firstly, essential oils come from herbs, but they are a lot more concentrated, and therefore stronger, than herbs. This means there’s an increased chance they could cause irritation and allergies; particularly in children. It’s also worth noting that aromatherapy oils affect children slightly differently than adults. Part of this is down to them being smaller, and another part is down to their bodies being more sensitive than an adult’s. So, much smaller quantities are required. If you try to expose your little one to an adult dose of essential oils, it’s going to cause all kinds of potential problems, including skin irritation and breathing difficulties. So, before using any aromatherapy oil on your baby, it’s important to remember they require a smaller dose than you’re used to using. But how do you measure the doses? Unfortunately, there’s a lot of conflicting advice there too. It does appear that most sources tell you to use a dilution of one eighth of the recommended dose on the back of the bottle for children aged 0-1. However, we would advise you to talk to your pediatrician beforehand to see what they recommend. There’s a lot of things to consider when introducing baby to essential oils, but the following are some general safety guidelines you should adhere to. Firstly, never let your baby ingest the oils. They are highly concentrated and should only be used topically after they have been diluted. An even better idea is to use a diffuser to blow the essential oil aroma into the air. Make sure you follow the advice above and use less than you normally would in the diffuser. Another important tip is to do a spot test on either baby’s leg or arm. Wait a few minutes and if there’s no reaction such as redness or other skin irritation, it’s a good sign the oil is likely safe to use. It’s also important to introduce just one essential oil at a time. Ideally, avoid using aromatherapy oils on babies under the age of three months old. This is because the skin doesn’t mature enough until then, leaving it more at risk if exposed to oils. Don’t use the oils in baby’s bath either. While they’ll obviously be well diluted, there’s the risk baby could splash the oils into their eyes, or they could swallow it. Finally, if this is your first time introducing your little one to essential oils, it can help if you start by wearing the oil yourself. Again, make sure they are well diluted, then as your baby has skin-on-skin contact, they’ll gradually get used to the oil. So, the above are the general safety guidelines to follow, but it’s always worth double checking with your pediatrician before exposing your baby to essential oils. They will have the best advice for you to follow. Which Oils Should Be Avoided? Peppermint – It’s a common misconception that babies can safely be exposed to peppermint oil. This essential oil should always be avoided on children younger than six years old. Eucalyptus – This is one of the few essential oils which can cause respiratory problems in babies due to its high 1,8-cineole levels. Therefore, it shouldn’t be used on children younger than ten years of age. Ylang-Ylang – This essential oil shouldn’t be used when you’re pregnant and it’s also unsuitable as a topical oil on children under the age of two years old. Lemongrass – Another oil to avoid using topically on children under the age of two. Other oils to use with caution include Wintergreen, Idaho Tansy, Sage, Clary Sage and Hyssop. This isn’t to say all other oils are safe to use, but these are the main ones to be cautious with. For example, Bergamot is typically considered safe to use on babies, though it is known to be phototoxic (which causes skin to burn more easily under sunlight.) This means, unless Bergamot is very well diluted or diffused, it can cause phototoxicity. All essential oils should therefore be used with caution. Which Aromatherapy Oils Are Safe For Babies? Basil Linalool – This great essential oil is known for its relaxing scent and it’s also great for easing sore muscles. Chamomile – It’s unsurprising to see this one listed as you can easily find chamomile baby lotions readily available at the store. It’s especially useful at promoting sleep. Lavender – Another relaxing aromatherapy oil which is well-used for its sleep enhancing properties. Besides these few aromatherapy oils, not many others are recommended for children under the age of two. However, these aromatherapy baby products should be perfectly safe for most babies provided you follow basic safety precautions. Perhaps one of the most important things to remember, is to be wary of where you actually buy the oils. Always make sure you’re buying from a well-respected source. Read reviews and do your research to see what other parents are using. There are sadly a lot of phony products out there; especially when it comes to essential oils. So, choose a brand you can trust and always seek your doctor’s advice before buying a particular brand. Overall, when well-diluted, aromatherapy oils can be a great way to promote baby’s sleep. 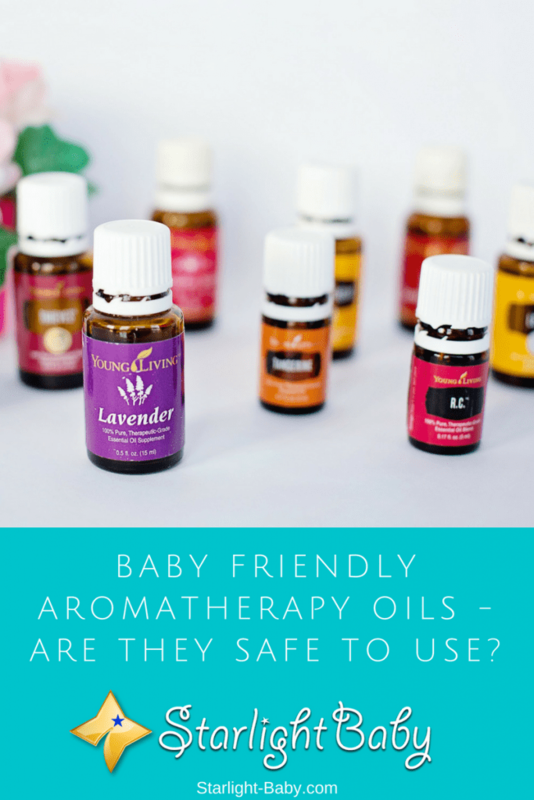 However, it’s very important to follow strict safety guidelines and as a general rule it’s much safer to diffuse oils, rather than try to apply them topically to babies. Aromatherapy diffusers are also safe for babies as long as the concentrate is not too high. I’ve always been very skeptical about using aromatherapy oils on my son. I know that they have a lot of benefits for adults because I do use them myself – especially love the lemongrass and lavender with its divine scent – but I didn’t know how they actually affect the babies body. That’s why I’ve always avoided using it on him. I was scared that it might possibly make him ill or damage his physical development in some way. My natural motherly protective instinct always shows when it comes to these sort of things. So, I’d like to thank you for explaining everything in such great details and giving us actual options as to which aromatherapy oil are suited for our little babies. I might try it in the future. I have never used Aromatherapy oils or essential oils in my five months old baby. Actually, I have never considered using Aromatherapy or essential oils in my baby, even though we use essential oils. I don’t see any necessity of using such oils. Perhaps, that’s because I don’t know the benefits of using such oils for the baby. I haven’t really heard about Aromatherapy oils before now, but from the explanation in the article above, I have being quite informed on the benefits of using Aromatherapy oils and how exactly to go about its usage. Thanks so much for this update, it’s definitely going to be helpful to me.